Need a compact loader to get big results? Choose the 324J. This versatile 54-kW (73 hp) machine combines outstanding maneuverability, travel speed, breakout force, reach, and stability in an innovative package. 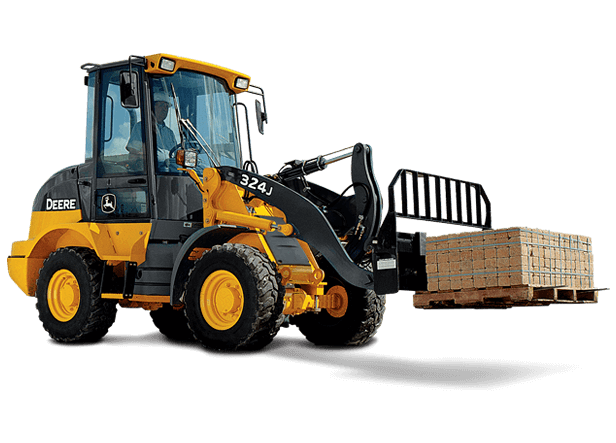 Its oscillating stereo steering delivers a turning radius that’s 20-percent tighter than comparable loaders for fast work cycles. Delivers smooth moves and better material retention over rough terrain, too. Add to that a redesigned, more spacious cab, and extra uptime from sealed electrical connections, more durable axles, and extended service intervals, and you’ve got a multi-purpose machine that’s ready, able, and willing to take on your many tasks. When operation is easy, maximum productivity becomes second nature. The 324J’s sound-suppressed spacious cab provides ample leg- and headroom, best-in-class all-around visibility, and one smooth ride. A single lever with FNR switch controls all boom and bucket functions, and standard return-to-dig is just a flick-of-the-wrist away. Gauges in the forward console are clearly visible, intuitive, and easy to read. Tilt steering, multi-adjustable high-back suspension seat, electronic monitor, and many more productivity-boosting features also are standard. Why invest in a bunch of specialized machines when the highly versatile 324J can do the job? With its standard pin-type hydraulic quick-coupler, the 324J lets you go from bucket to forks, quickly and easily. Or opt for the Worksite Pro™ skid-steer-style coupler that enables this jack-of-all-trades machine to utilize an even wider array of skid-steer-compatible Worksite Pro attachments. Operation is easy, with joystick and third- and fourth-function pilot controls conveniently located at your fingertips. Regardless of how you equip it, the 324J will be the most versatile compact machine on your worksite. Bucket Capacity (1.1 m³) 1.4 cu. yd. Breakout Force (5608 kg) 12,364 lb. Full-Turn Tipping Load (4225 kg) 9,315 lb.